Professor Stephen Greenblatt, who was in Iran to attend the First Int’l Conference on Shakespeare Studies, has said, “I never thought that Shakespeare would become my magic carpet to the land of Persia, where I wished I could have seen someday”. 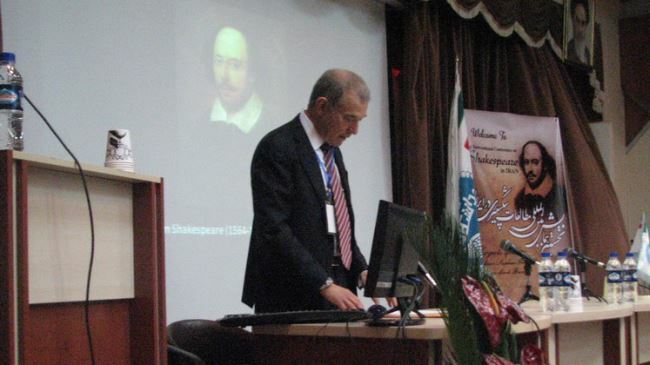 Pulitzer Prize-winning author Professor Stephen Greenblatt visited Iran during the First International Conference on Shakespeare Studies at the University of Tehran. “I never thought that Shakespeare would become my magic carpet to the land of Persia, where I wished I could have seen someday,” said Harvard scholar Prof. Greenblatt when he expressed his enthusiasm for Iran and Persian cultural and historical heritage during the conference. One of the world’s most celebrated Shakespearean scholars, Greenblatt took part in the conference and delivered a keynote speech on November 26. He is best known for his biography of Shakespeare titled “Will in the World: How Shakespeare became Shakespeare,” which was on the New York Times Best Seller List for nine weeks. He also won the Pulitzer Prize in 2012 for his groundbreaking book, The Swerve: How the World Became Modern. Organized by the Faculty of Foreign Languages and Literatures, the University of Tehran, the conference was held on November 26-27, 2014. The conference explored themes such as ‘Shakespeare and Political Discourse’, ‘Shakespeare under the Iranian Eye’, ‘Shakespeare and Adaptation’, ‘Radical Shakespeare’, ‘Shakespeare and Mysticism’ and ‘Shakespeare and Popular Culture’. Prof. Mark Burnett from Queen’s University in Belfast, was another keynote speaker whose discussion focused on cinematic representations of Shakespeare in Iran. He talked about an Iranian adaptation of Shakespeare’s Hamlet entitled Doubt (Tardid), a 2009 Iranian Crystal Simorgh-winning film directed by Varuzh Karim Masihi. Iranian scholar, author and lecturer on literature, art and mysticism Hossein Elahi Ghomshei also spoke at the literary gala.